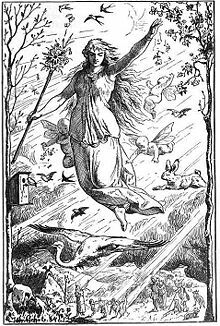 If your family is like many pagan families, you may have already celebrated Ostara during the Spring Equinox, which was March 20 this year. However, many families opt to celebrate Ostara, during the time when other families traditionally celebrate Easter. This can make it easier to coordinate with school schedules, as well as with family events and days off. Either way is fine to do, and if you haven’t yet celebrated Ostara with your family, there is still plenty of time to do so by next Sunday. Here are a few activities you might be interested in doing together. Spring is here! The crocuses are peeking up at us, the daffodils are bending toward the sun, and the sun itself is greeting us with longer days and warmer weather. If you’ve been ready for spring all winter, it’s time to really start making those plans and enjoying spring of 2010. Here are 10 fun things you might want to add to your to-do list. Okay, while this one isn’t the most fun, it’s definitely needed after a long winter’s stay indoors. And who’s to say you can’t make it fun? My daughter and I love smudging every month, arranging things for optimal feng shui, and creating new washes and incenses to use. And while the actual nuts and bolts of cleaning may not be so enjoyable, visualizing, telling stories, or even dancing while doing it can certainly be.